New Iberia City Hall is located at 457 East Main Street, New Iberia, LA 70560; phone: 337-369-2300. Photo: Steamboat House, ca. 1890, 623 East Main Street, New Iberia, LA. Listed on the National Register of Historic Places in 1979. Photographed by user:Z28scrambler (own work), 2010, [cc-by-3.0 (creativecommons.org/licenses/by/3.0)], via Wikimedia Commons, accessed April, 2015. New Iberia was founded in 1779 by a group of Spanish pioneers. New Iberia became the local port for the Bayou Teche region (also known early on as the "Attakapas" region) because it was the head of navigable water for most steamboats during much of the year. In the 1840s, there were three steamboat landings in New Iberia. These were at the foot of Serrett, Iberia, and Fisher streets, where warehouses for loading and unloading goods were located. These landings continued to be used into the 1900s. Shallow draft steamboats exponentially increased the speed and volume of trade and transportation possible along the waterways. By 1845, 34% of steamboats docked at New Orleans were from the Bayou Teche area. The introduction of the railroad into the Bayou Teche region during the later 1850s expanded the New Orleans market for goods and increased the volume of New Iberia's commerce. This was in spite of the fact that the railroad ended at Brashear City (as Morgan City was known then). Goods loaded at New Iberia were transported down Bayou Teche to Brashear City, where they were loaded onto railroad cars bound for New Orleans. Likewise, goods from the trains were sent to towns along Bayou Teche by loading steamboats at Brashear City. The railroad link cut out the Atchafalaya Basin part of the steamboat transfer of goods to New Orleans. 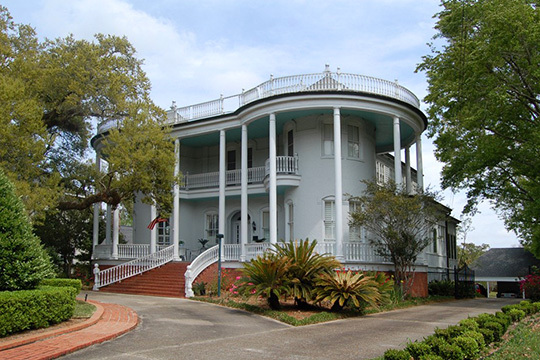 During the Civil War, Federal troops invaded the Bayou Teche area in 1863 and occupied New Iberia. Many of the local steamboats had been converted by this time into lightly armored warships or troop and supply transport vessels. There were a number of engagements involving Union and Confederate vessels on the Lower Teche and along the Atchafalaya River during the war, but there was relatively little of this activity in and around New Iberia itself. During the mid-late 1870s competition between steamboats was intense, and steamboat owners had to gain contracts to carry U.S. mail or tow lumber or logs to stay in business. The completion of the railroad line between Brashear City and New Iberia in 1879 made it more difficult for steamboat owners to stay in business. Those who succeeded made the transition from being large freight carriers to taking passengers on pleasure excursions and being jobbers (carrying freight for a variety of clients rather than running scheduled trips between ports). Steamboats continued to supply freight and goods to and from the mills and plantations along Bayou Teche at the beginning of the twentieth century. They also transported rafts of logs from the Atchafalaya Basin to local sawmills and kept up their jobbing runs. In 1910, Consolidated Companies of Plaquemine, Louisiana, operated a wholesale grocery warehouse in New Iberia in the area bounded by Main and Fisher streets. The company operated the steamboat V.J. Kurzweg which carried groceries to establishments along Bayou Teche. The last known steamboat to bring goods to New Iberia was the Amy Hewes, in 1942. This steamboat carried lumber from the Atchafalaya Basin to New Iberia sawmills. New Iberia Shipwreck, Iberia Parish, Louisiana, nomination document, 2008, National Park Service, National Register of Historic Places, Washington, D.C., crt.state.la.us, accessed April, 2015.